Nothing modest or flawed about this image Mike, I think it’s an absolute beauty! Thanks so much for the words of encouragement. It’s hard to look at my own work objectively and sometimes I can be my own worst critic. As usual, your bird shots are great! Thanks, kenne. Like most photographers, I tend to be a bit hard on myself and occasionally let self-doubts creep in and mess with my head. I think it is a fine shot, Mike. He is lovely and I love the pinkish-beige background. Thanks, Eliza. The background definitely helps the little bluebird to stand out. Gorgeous image, Mike, and so perfect for these Autumnal days. Thanks for the encouraging words, Laura. Mike, I’m quite cross that you could possibly consider NOT showing us this wonderful photo of such a colourful little bird 😉 The colours are standing out so well! Awesome! You made me laugh, Liz, with your comment. Choosing a photo to post sometimes is an easy process, but at other times it is complicated by my mood of the moment. Benjamin says : “The orange-bluebird gets two thumbs up!” Thank-you, Mr. Mike!! Wow. Benjamin has always been a fan of the orange-bluebird. Thanks for the vote of confidence. I’ve always believed that if we love something about a photo then others will too. I like this one! 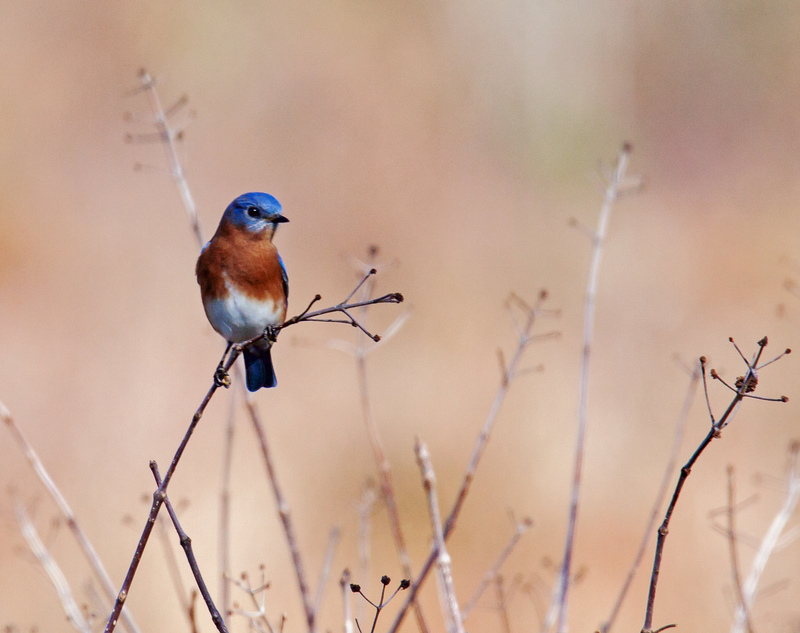 This is a lovely Bluebird image and has captured how I often see them, if fleetingly. I especially like the inclusion of the environment and the composition. The muted colors in the background are a great touch. Thanks, Ellen. I should try to include more of the environment more often and do so intentionally and not just out of necessity. If I think rationally, I realize that self-doubts are an inevitable part of the creative process, who when the ego is involved, it’s easier to react emotionally rather than rationally. And questioning is how we grow, so that’s a good thing! Bluebirds always increase my hope! Thank you. Thanks. I do enjoy sharing my adventures with other folks. When it comes to photos, it is hard to know which ones are “good enough” to share. Sometimes I get caught up in deciding if a given image is sharp enough or detailed enough and so on and forget that the basic decision should be simply whether I like the photo. Mike, this bluebird photograph is memorable … causes me to want to adopt it to be my icon/ sometimes… or often … yet not without your approval and name on it somewhere. How does this work? Really, it must have commercial possibilities, and if it’s already out there, let me know. You must have credit for your so inspired work … (and writing). Bonnie. You are welcome to use the image in whatever way you like. I never really like watermarking the image, i.e. putting my name on the image itself. If you want to just make a reference to me or to my blog address (michaelqpowell.com) that is more than sufficient.